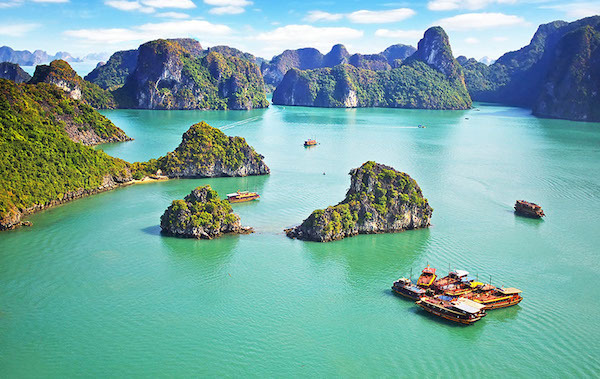 This immersive tour takes you to the remote villages North of Hanoi and then to the iconic Ha Long Bay and beyond to the lesser known Bai Tu Long Bay - Just as stunning but a little less visited. 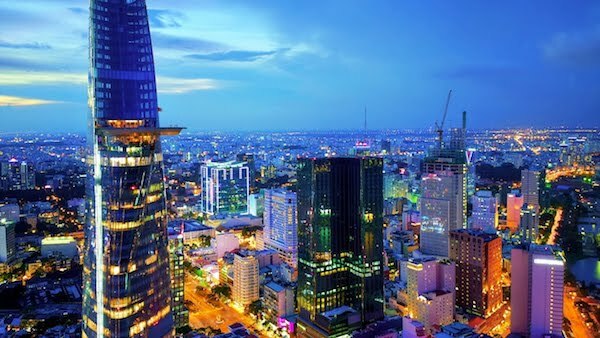 You will be picked up from the airport and transferred to your Deluxe hotel in Hanoi. Then early the nest morning we head off to Ba Be National Park. Ba Be is a haven of extraordinary scenery, fascinating biodiversity and rich culture. The ethnic minority communities live in small hamlets and still maintain a simple way of life, living off the land and fishing from the lakes and rivers. As you adventure through the national park you will have the chance to meet the local people and discover their history and culture. 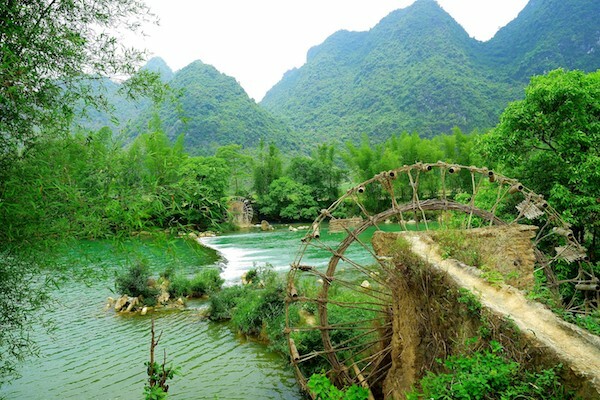 You will experience a homestay here and then The next destination on our trip is Cao Bang Town. where, the Hmong, Zao, Tho and Nung ethnic minority peoples live. On day 4 we head to Ban Gioc Waterfall, the fourth largest waterfall along a national border, You’ll also get to board a bamboo boat and get right up close to the raging waterfall. Next we’ll visit a local market where you get to experience the diverse cultures of the area, before hiking to Phat Tich Temple and stay overnight in Lang Son. Day 5 we head to Ha Long Bay and on to the more remote Bai Tu Long Bay. Where you will board a traditional Vietnamese Junk. Overnight on-board with the ship anchored in the Cong Do Area of the bay. After your breakfast you cruise towards Thien Canh Son Cave and you will have time to explore the cave before cruising back and disembarking where your driver will meet you to take you back to Hanoi. From start to finish, this company went above and beyond to make sure this was a truly unforgettable trip. All of the staff were friendly and helpful when booking the tour and as soon as we met Mr Linh, we knew we had chosen the right company! Our trip to Ba Be was a definite highlight of my time in Vietnam. As well as seeing all of the main attractions, which really are breathtaking we also enjoyed getting off the beaten track and experiencing some of the local villages and meeting the people that live there. We spent 6 days on the Highlights and Hidden Gems of Halong Bay and Ba Be tour with our guide Mr David Long and our driver Mr Nam. We were a bit apprehensive to begin with as we are usually independent travellers however we absolutely loved the experience for its authenticity, flexibility and accessibility to areas and people we would not normally have had access to. This is a tour company offering exceptional service right from the beginning of the booking process to the end and the drop off at our hotel. I can not say enough good things about how amazing this experience was. Even down to the initial inquiry to the drop off at the hotel at the end every second of this trip was perfect! Upon arrival at Noi Bai Airport, you will be welcomed by your guide and be driven to your hotel for check-in. The rest of the day is yours to discover the magic of Hanoi, capital of Vietnam. You will stay overnight in a hotel in Hanoi. Your guide will pick you up by car at your hotel around 7:30-8:00am, as an early start is necessary for all in store for you today. then travel to the Tay village of Coc Toc, where the houses are built in traditional Tay fashion on stilts. The local Tay population is extremely friendly to visitors and will welcome you with open arms, introducing you to their way of life. The central pillars of which are fishing on the lake and rice-farming. This is where you will spend the night in a homestay, to really get an insight into Tay culture and daily life. After checking in at the homestay, your afternoon will be free to spend as you wish, though we recommend going for a walk to explore the beautiful surroundings. Following this, we will take you to Hua Ma Cave, featuring thousands of stalactites and stalagmites. The rest of the day is again yours to do with as you please, though we offer the optional activities of guided walks/bike rides around Coc Toc Village and kayaking trips on the lake. If you’d rather spend the rest of the day relaxing and enjoying the serene views, then that’s also an option. The next destination on the trip is Cao Bang Town. Here, the H’mong, Zao, Tho and Nung ethnic minority people live together in harmony. After breakfast, you’ll set off on a half-day journey past spectacular mountainous landscapes, with a mixture of steep terraced rice fields and hill-tribe villages. Along the way, you can make stops at your leisure, to rest the legs and take some wonderful photographs. The remainder of the day will be free to explore the town or simply relax. Dinner on your own, then overnight in Cao Bang. 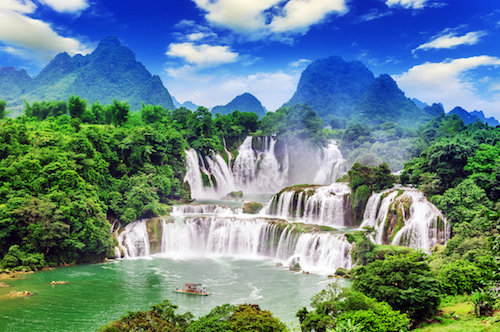 Today you set out for one of Northern Vietnam’s most incredible natural wonders, Ban Gioc Waterfall, the fourth largest waterfall along a national border, after Iguazu Falls (Brazil – Argentina), Victoria Falls (Zambia – Zimbabwe), and Niagara Falls (Canada – America). This breath-taking 300-meter wide cascade forms part of the Chinese- Vietnamese border. Here you can relax in this natural wonder with plenty of time to snap some photos. You’ll also get to board a bamboo boat and get up close to the raging waterfall. Next, you’ll visit a local market where you get to experience the diverse cultures of the area, before hiking to Phat Tich Temple which aside from being a great cultural experience, offers some of the best views of Ban Gioc with China in the background. For those that are interested in learning about local life in the bay. Take a bamboo rowing boat trip lasting roughly 45 minutes, around Vung Vieng fishing village, one of the largest of its kind in Ha Long Bay. The village is set inside a closed lagoon, surrounded by mountains, which makes it a great place for photos in addition to the cultural experience. For the more active travellers you can be taken in a small boat to Ban Chan beach, where you can sunbathe, swim, play volleyball or try your hands at some kayaking in the magnificent setting of the bay. You’ll arrive back at the cruise around 16:30, with enough time to get cleaned up and relax before the sun starts to set. At 17:30 you can enjoy happy hour at the bar on the sun deck, enjoying the sunset with a drink in hand, and also take part in a cooking class with the resident Chef. At 19:00 dinner will be served, and the rest of the evening can be spent socialising with other guests, night squid fishing or just lazing around. There will also be singing and dancing activities until 22:00.Overnight on-board with the ship anchored in the Cong Do Area of the bay. Early risers can enjoy a 30 minute Tai Chi exercise on the sundeck at 06:30 before enjoying the view of the surrounding seascape with your breakfast as you cruise towards Thien Canh Son Cave. You’ll arrive at the cave at 9am and spend about half an hour exploring this medium sized and less visited cave situated in Bai Tu Long Bay. After your cave visit its time to check out of your room at the boat and return to port, docking at noon. After having early lunch on-board. Our driver will be waiting for you at the pier and will transfer you back to Hanoi for an arrival at your hotel for around 16:30.